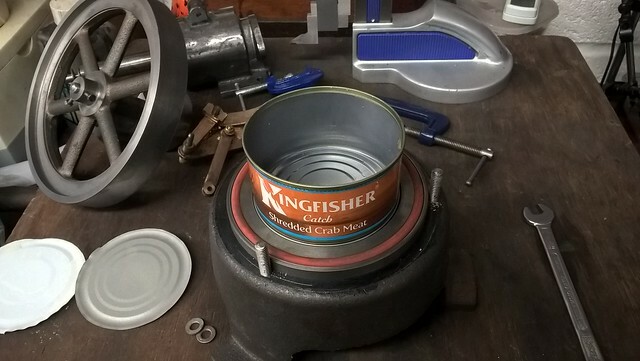 the Tesco Tuna tin is 38mm deep, if that won't do and I can't source a tin of the appropriate size then I'll fabricate a lightweight regeneratice displacer using thin brass sheet. Just had a look through mine: John West & Waitrose (160g) are 37mm high and Asda is tallest at 41mm (185g) . If you can't get the right size of tin can, lookout for a stainless steel container, stainless cup, mug, kitchen containers. 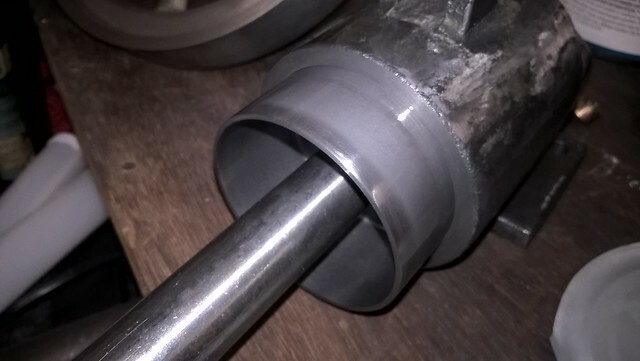 Another way is thin walled stainless tube, with a cap TIG welded on one end to form a cup. Steel, stainless or not is always better than brass. Hi Ian, yes I'd prefer stainless but getting it welded at a low price would be a problem for me, in the past I think you've mentioned that you have a friendly TIGer. Jo - oooh Waitrose - posh stuff, I'll take a ruler next time we go shopping and look at a wider range of tinned food. Searching the Internet I saw images of Sirena and John West tinned tuna 185g sold in Australia. The proportions of those tins looked much deeper than UK equivalents. A lot on non running hot air engines have used “ Cuprous “ based materials for the displacer piston. The highly thermally conductive material will equalise, very quickly the temperature differential that’s needed for these types of engine to run. ASDA sell a tinned Crabmeat, “ Kingfisher “ I think? The tins are exactly right and light enough for the job. The regenerative packing material is a couple of Stainless Steel pan scrubs neatly stuffed inside before soft soldering the lid back on. 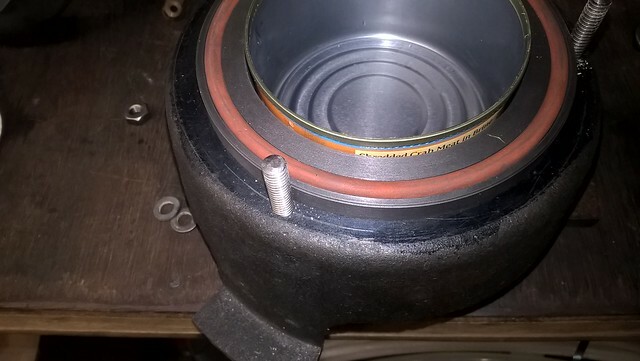 I say “ neatly “ because after sealing the piston you need to carefully hold and then drill through the soldered top at 5/16” or 8 mm and then push a 2 BA clearance drill through the bottom. The final part of the job is to provide passage of the air through the regenerative material. I have inherited a set of specially ground drill bits that have a point and then two sharpened edges that neatly cut to their diameter. I place 4 holes through the top and then rotate by 45 degrees to place the 4 holes through the bottom. we immediately spot a hot-air engine builder in a grocery store, he does his shopping with a caliper. Indeed, I was very carefully scrutinised by a little old lady whilst measuring the various tinned fish products! She actually asked me what I was doing. Upon providing my answer a look of total blankness appeared. It was all I could do to stop myself laughing! PS. Yes Jason, a very light gauge SS tin, Silver soldered would suffice. Yes Jason I could have a go at soldering up stainless steel but I'd have to obtain the material which might take longer than using a tin. Meanwhile, because I don't like crab meat a friend who does is going to buy a tin of Kingfisher crab meat from Asda tomorrow and bring the empty tin over on Saturday. I've given him the dimensions. A sight unseen since 1991. 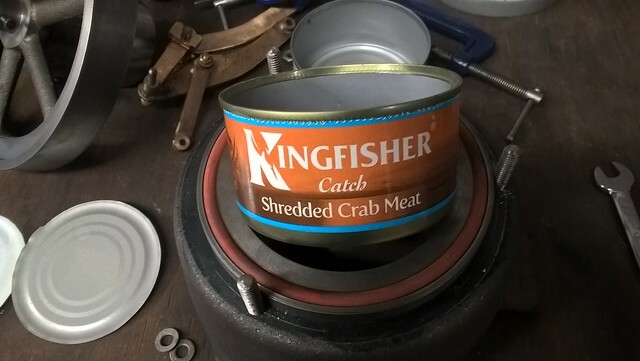 A Kingfisher Crabmeat tin is a close fit. My friend brought round the empty tin this morning. it is 47mm deep as recommended by Graham and the diameter in particular the top rim is a close fit in the displacer cylinder = 3.4" bore. If I'm successful turning it into a displacer I'll bore out the cylinder to suit. P.s. my friend enjoyed the crab meat. That tin has a draft angle on it, I thought the sides needed to be parallel if it is ok the an alternative may be to buy the tins of Salmon. I think the angle on those spun/pressed tins is so minimal it is not worth worrying about. I haven't noticed whether the tins are tapered. The displacers I made for my Rider Ericsson and Heinrici hot air engines have a clearance within the displacer cylinder so that the air can pass freely. As for a 24mm bore Robinson perhaps a small paint tin would suit. Jo - you might be waiting for new platforms to be cast like me. The platform on my engine is no good because of cold shuts and blow holes. Graham is repairing the patterns and we've agreed to meet up when he's ready and I'll take the patterns to the AJD foundry in Brierley Hill. Bad Behavior has blocked 14584 access attempts in the last 7 days.